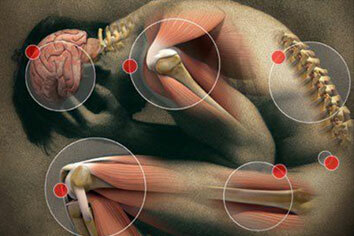 A common example of Myofascial Pain Syndromes (MPS) is fibromyalgia. This is caused by chronic injury or disorder of the muscles and their surrounding fascia. Cause of the injury is frequently unknown. It usually causes widespread pain in the muscles and can vary in intensity from mild to severe. The patients with Myofascial Pain Syndromes often develop painful bumps under the skin called trigger points. These trigger points eventually cause pain and twitching in the underlying muscle when pressed. If you have symptoms indicating Myofascial Pain Syndromes, contact us and get complete Myofascial Pain Syndromes treatment.